The protests that followed the police shooting of Michael Brown created a network of youth in revolt. When Darren Wilson, a white police officer in Ferguson, Missouri, shot and killed Michael Brown on August 9, King D. Seals, age 27, was at the crime scene within the hour. He lives just a few blocks away from Canfield Green, the predominantly black apartment complex where the unarmed teenager was shot. He saw Brown’s body, which would lie on the street for an additional three hours. “It wasn’t even a protest yet,” Seals said about the gathering when he first arrived. “It was a black boy being shot in the community. It was about ten other women and men out there, and the family.” The next day, members of the community passed around a large plastic bag for donations to Brown’s family. Seals put in $100; others donated $50, $20, whatever they could. By the end of the day, the bag was filled with money. “Before it became a riot, before it became a protest, it was just the community coming together,” Seals said. On the second night, there was a protest on West Florissant Avenue, and the St. Louis County police met it with armored vehicles, M-4 rifles and riot gear. Officer Wilson remained unidentified and unarraigned, even as protesters called for his arrest. During the first week, a few demonstrators resorted to property damage to air their grievances. Seals remained on the front lines through the height of the police crackdown—and not for the first time. Last year, he protested when Cary Ball Jr. was fatally shot twenty-one times by police officers in St. Louis City. He is still in contact with Ball’s mother. Recalling the differences between last year’s demonstrations and this year’s, Seals said that the protests in the wake of Brown’s death were more effective. After Ball was killed, “we did everything positive; we did everything peaceful…I feel like [the Ball protest] is a prime example that when you do things quote-unquote ‘the right way,’ you don’t get any results.” The internal police investigation later declared the shooting of Ball justified. The Ferguson Freedom Fighters were not the only ad hoc group to form in the crucible of the Michael Brown protests. Marching for justice during the day, and running through clouds of tear gas by night, young protesters bonded and shared ideas. Cliques formed, occasionally along the lines of common interest or social class, but more often by happenstance: the Lost Voices, the Millennial Activists United and Hands Up United. When the protests slowed, these groups stayed in touch. They held strategy meetings in churches and schools, attended training sessions by national organizations, made T-shirts and solicited donations. They have shifted the political culture in the city, and their goals, as they develop, will be crucial to its future. “Our work is in the beginning stages of going national,” said Ferguson activist Taurean Russell. “People are seeing we have political power, and you also have power of the people. People are willing to put their bodies on the line.” Russell works with Hands Up United, a new coalition that includes the Organization for Black Struggle and Missourians Organizing for Reform and Empowerment, two longstanding groups dedicated to combating injustice and inequality. “I had never protested, marched or anything like that before,” Russell recalled. “Then I saw that body lying out there for four hours and said, ‘That could have been me.’” He remembered turning off his TV and driving down to the scene of the shooting that afternoon, where a crowd had already gathered. Russell tweeted out a call to action and joined a group of eight other first responders. They marched to the Ferguson Police Department to get answers. Two weeks after the shooting, Russell, along with local rapper Tef Poe and activist Jeffery Hill Jr., held a press conference to unveil a list of demands. Seated before the gathered members of the local and national media, they called for the immediate arrest of Officer Wilson, the removal of St. Louis County prosecutor Robert McCulloch from the case, a federal civil-rights investigation of north St. Louis County’s police departments, and the firing of Ferguson Police Chief Thomas Jackson. This was the first time the trio spoke under the banner of Hands Up United, which has become one of the more visible forces in the ongoing search for justice in Ferguson. Russell and his colleagues are still leading efforts to register voters, train activists and organize further actions. Hands Up United was joined in the protests by Millennial Activists United, a group made up of nine students and recent grads who were initially more focused on documenting the events. MAU’s members—five women and four men—met through Twitter during the early days of the protests on West Florissant Avenue. They quickly developed a tight-knit community, sustained by their addiction to social media. Together, they live-tweeted, Vined and Instagrammed every protest, through the sweltering days and tumultuous nights, as well as the direct actions taking place elsewhere in the St. Louis area. Their follower counts skyrocketed. In the beginning, the members of MAU played a mostly supporting role in the protests, while producing a steady stream of tweets. They’d offer rides to people who wanted to attend the protests but didn’t have the means. They’d take part in direct actions called by existing grassroots organizations. During one of these rallies, a demonstration outside the building that houses Governor Jay Nixon’s St. Louis office, 28-year-old Larry Fellows—one of the nine members of what would become Millennial Activists United—was arrested and charged with failure to disperse. After this, the group became a cornerstone of the Ferguson protests. These days, MAU has decided to put its efforts toward political education. “There needs to be something in place where people that want to run for office in their own communities can be well prepared and well equipped to do so,” said Brittany Ferrell, a 25-year-old student and Millennial Activist. “If they understood the power in that, they could cause a shift in a major way.” The first step was to hold weekly Twitter discussions under the hashtag #FergusonFriday, which continue to this day. Along with refocusing the national spotlight on America’s race problem, the Ferguson protesters can already claim at least two other victories. On September 4, the Justice Department launched a probe of the Ferguson Police Department to determine whether its officers engaged in a pattern of civil-rights violations—a mere rung below Hands Up United’s demand for a countywide investigation. Four days later, the Ferguson City Council announced a set of proposals in response to the protests, including a reduction of the municipality’s crippling ticket fees, which had come under intense national scrutiny, and the establishment of a civilian review board to monitor police activities. Still, even with this progress, don’t expect Ferguson to fade away anytime soon. More than 3,000 residents have registered to vote in the next election. As the national media turned their attention elsewhere, a group of young activists calling themselves the Lost Voices rose to prominence. Its members, ages 15 to 26, staked out a campsite behind a barbecue joint at the corner of Canfield and West Florissant, where they slept for weeks. Community members and fellow activists, inspired by their dedication, donated tents, food and other essentials, as well as a basketball hoop. The ten activists took to the streets every night at 7 pm to march and chant, encouraging others to join. “If people riding on the street see us every day, it’s going to make a difference,” said Cheyenne Green, a 21-year-old resident of neighboring Dellwood. It didn’t take long for others to rally behind the Lost Voices’ enthusiasm. When the police dismantled the activists’ campsite, forcefully arresting two in the process, outrage ensued. Hands Up United posted a video of the raid on its website. Members of MAU tweeted their support. Although the many emergent activist groups in Ferguson vary in their tactics, it is clear that they see themselves fighting for a common cause. 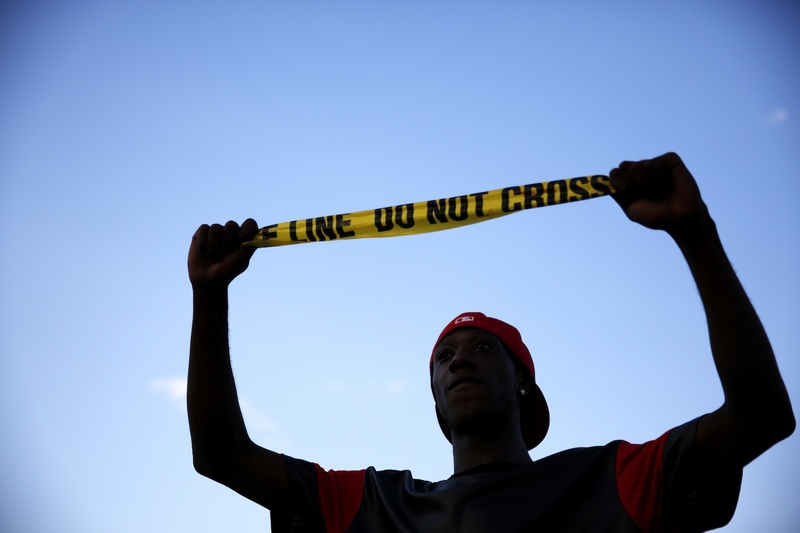 Two months after Michael Brown’s death, they’re still fighting. Protests at the Ferguson Police Department’s headquarters happen regularly. Activists aren’t afraid to be arrested, blocking roads and disobeying commands to disperse to bring attention to their movement. The grand jury hearing evidence on Officer Wilson’s role in the shooting is due to make its decision soon, and rumors swirl that those seeking justice for Brown will not be happy with the result. What happens next will be shaped by Ferguson’s newest, youngest and fastest-growing political force. Raven RakiaRaven Rakia is a journalist focused on policing and prisons.